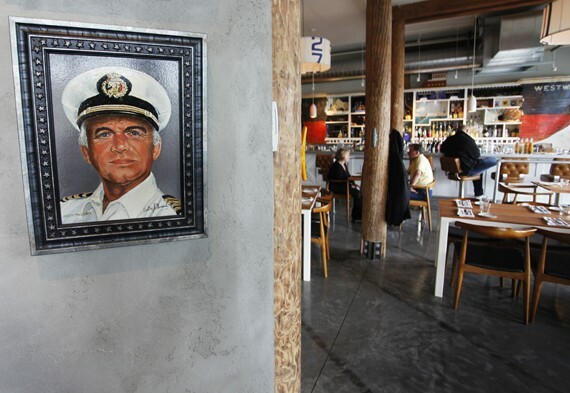 Formerly helmed by Joshua Henderson, who recently sold the restaurant to restaurateur Renee Erickson, this waterfront restaurant is a little bit Northwest, a little bit Jacques Cousteau, with its nautical decor inspired in part by The Life Aquatic with Steve Zissou, and has an outdoor area featuring Adirondack chairs for lounging around an oyster-shell fire pit. There are fresh oysters on the half shell, small plates like steamed Manila clams and grilled octopus salad, larger plates like roasted arctic char, and veggie sides. Menu offerings change often depending on seasonal availability, but the wood oven roasted rainbow trout—grilled whole and deboned tableside—is a highlight, tender and rich with clean, sweet brown butter and romanesco. Happy Hour Mon-Fri 4-5 pm; Sat-Sun 3-5 pm (discounted oysters, wines, draft, cocktails, daily specials).